AT TOPS, we listen when neighbors like you ask for more of your favorite products. That's why we're always adding more natural and organic products to our store from snacks to frozen meals and paper products to beauty care products. We're constantly working with our growing partners to bring you more of your favorite fruits and veggies that are certified organic. We feel good knowing you're getting fresh, safe produce that is grown with the best practices and intentions in mind. Look for this symbol throughout the store for all your organic favorites. 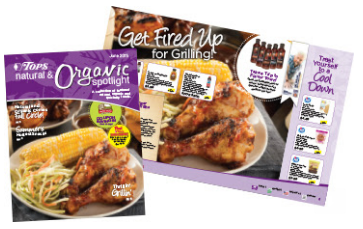 Plus, be sure to check out the TOPS Natural & Organic Spotlight magazine, where we feature the newest and most popular natural, organic and specialty items each month.